For many, this season is the most wonderful time of the year. With chestnuts roasting on an open fire and Jack Frost nipping at your nose, how could you ask for anything better? But for others who have lost a dear friend or loved one, the stretch of time from Thanksgiving to New Year's can be one of the most challenging times of the year. Healing from the pain of loss, grieving, dealing with heartache - these all take time and are paths that everyone has to navigate at their own pace. The happiness of the holidays won't automatically erase those feelings. In fact, it can amplify them. The scenery has changed. People who were once permanent fixtures are no longer at the dinner table. Memories of the way it used to be can overshadow the happiness of the current moment. While there is no way to erase the grief or pain felt when someone you love is gone, we've compiled a few ideas to help ease it. We tend to reflect upon specific actions unique to our missing loved ones. Instead of just remembering these special things, put them into action. Make their favorite dish or dessert, decorate the tree while listening to the same holiday music, or wear the same silly outfits. Talk with friends and family members about any difficulties you're facing and work together as a community to heal. This could look like finding solace in these age-old traditions or finding joy in new experiences. Remember, the experience isn’t the same for everyone. Whatever special activities you do this season, it may seem difficult in the beginning. However, sometimes “going through the motions,” especially during the holidays, is an intimate way to remain connected to the very essence of your loved one: who they were and still are in your life. Remembering through living is a beautiful way to honor their memory and can be very therapeutic during this time. Colder weather and shorter days can lead to a slower pace of life. Sometimes, slowing down is a good thing. Other times, it's a vehicle for too much alone time with your thoughts and pain. Instead, make an extra effort to attend holiday parties and get-togethers with friends. Seek out volunteer opportunities (which are abundant this time of year). Don't mask your grief with a false sense of happiness - but don't allow it to overcome you, either. By spending time with people and focusing on the needs of others, you can find renewal and fulfillment in the midst of heavy grief. Do you tend to see the world as "glass half empty"? It's certainly easy to do when you're in the middle of a sad time of life. However, making the conscious effort to change your perspective to a more positive one can improve your emotional and physical health. Remember the good times - actively and purposefully spend time remembering and recounting with others happy memories of your loved ones. Take a walk - Get outside in the sunshine. Get some exercise. Invite a friend to come along. Regular physical activity will help you positively manage stress and keep your body healthy. Do something you love - We often encourage (and just did above!) to care for others. However, caring for and spending time on yourself is equally as beneficial. Make time for the hobbies you love, treat yourself and some friends to a fun evening out. Whatever you like to do, make time for it! Don't wait for the fun to come into your life again. Make it happen. 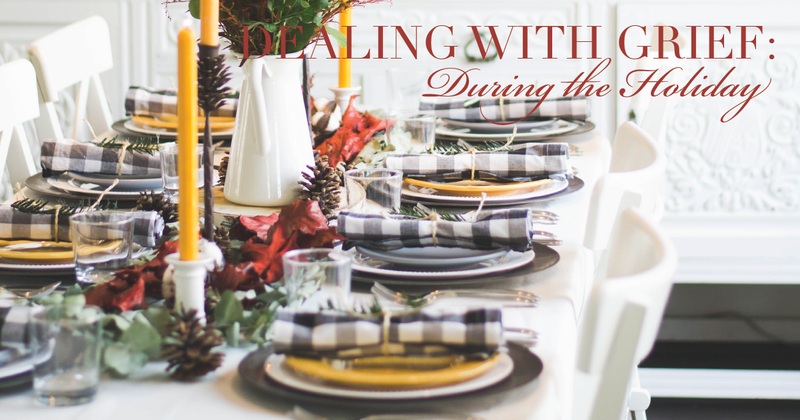 The happiness of the holidays and a few tips and tricks don't change the fact that grieving and healing are ongoing processes. Give yourself time and grace to work through your loss. Allow yourself to feel the pain and loss you're experiencing. Pretending and keeping your emotions inside often results in increased feelings of hopelessness and isolation. However, don’t stay there. Ask for help. Talk with friends and family. Let others in on your journey through grief and healing.